Casa Ruby in Finca Angelus is situated in La Matanza de Acentejo in the wine region of Tenerife. 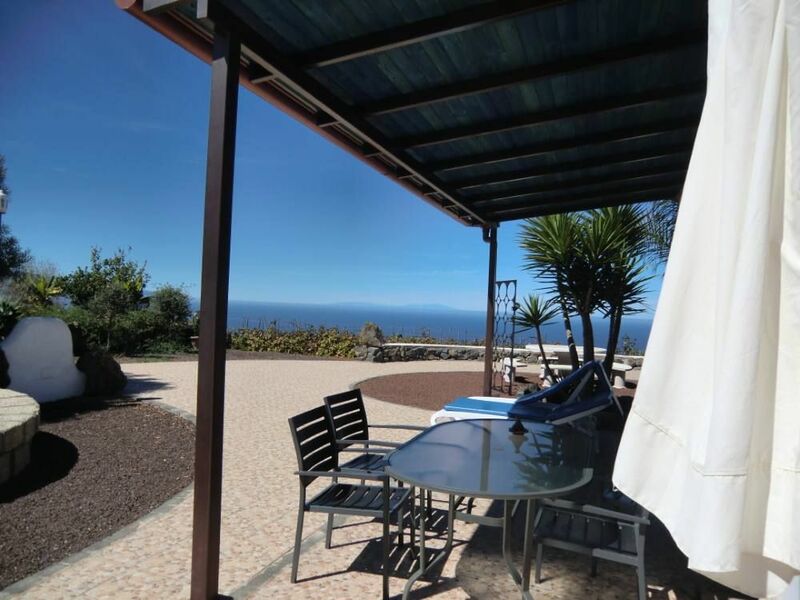 Due to the soutwest location of the finca one has a splendid view of the Pico del Teide, Spains highest mountain and UNESCO World heritage site since 2007. The coast and Atlantic Ocean also provide for a magnificent Panorama. The Canaray architecture is influenced by various cultures and being a painter and sculptor Claude incorporated several elements of the architecture into the design and decoration of Finca AngelusCasa Ruby, Bungalow in Finca Angelus, with vinyards. Livingroom with fantastic Sea- and Mountainviews Sat T.v. Music Wifi. Open kitchen with 4 cookingplates microwave,kettle, Coffeemakers (Senseo, Filter Nespresso), fridge with freezer, toaster. 2 Bedroom, (one bedroom with bathroom/shower en suite). 1 Bathroom bathtube/shower with bathropes and hairdryer. Safe. Covered terrace with furniture incl sunbeds. Erstklassige Finca sowie professioneller Service in herrlicher Umgebung. Die 12 Tage waren wunderbar und es hat an nichts gefehlt. Ganz lieben und herzlichen Dank an Ankie y Claude von Finca Angelus. Wir wären gerne länger geblieben, aber es kommt ja 2019. Feliz navidad y prospero año Nuevo a todos! Eine wunderschöne Villa mit viel liebe eingerichteten Appartements alle mit direktem Blick aufs Meer, herrlichem Sitzplatz und grossem Swimmingpool. Alles perfekt sauber und gepflegt. Die Gastgeber heissen dich herzlich willkommen und sind für fragen jederzeit erreichbar.